This is a very special birthday gift KT got from my parents this year. It’s special not only because it came from my parents, it’s special considering the distance it travelled and the number of people who helped in bringing it over. My dad first saw this set at a friend’s house in Singapore and kept raving about it. He didn’t know how to describe it. He said, “It’s something like building blocks, but not blocks!” I had no clue what he was trying to say. He was so impressed that he asked one of our friends in Japan to pick one for KT. And that’s where it’s two month long journey began. It flew from Japan –> Singapore –>Kerala –> Tamil Nadu and finally made it to our home in Hyderabad! It was only after seeing it, I kinda figured what Dad was trying to say. 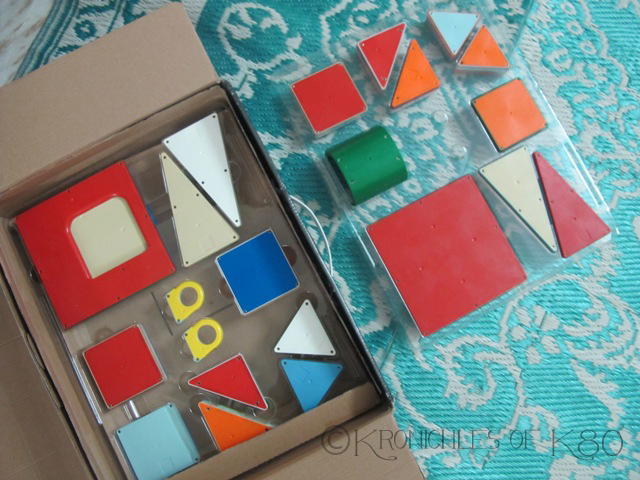 It’s a set of magnetic tiles in different geometrical shapes. It’s designed in such a way, that the corners of one tile gets stuck to another in any direction. It’s designed for 2 – 6 years olds. 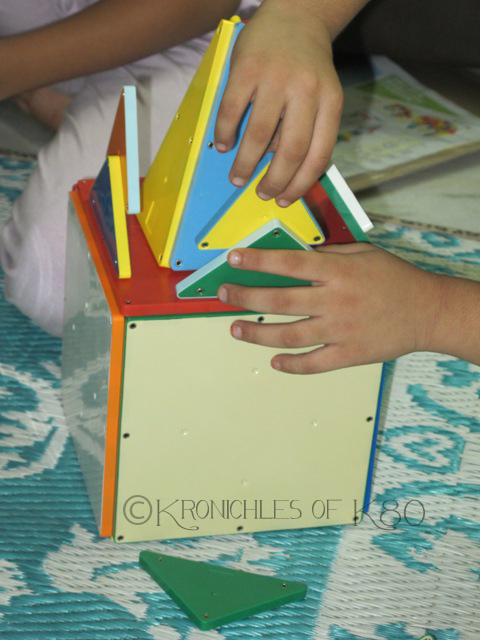 Younger kids can have fun sticking the tiles together and creating basic 2D shapes, while older kids can create structures and animals using the instruction sheet and their creativity! 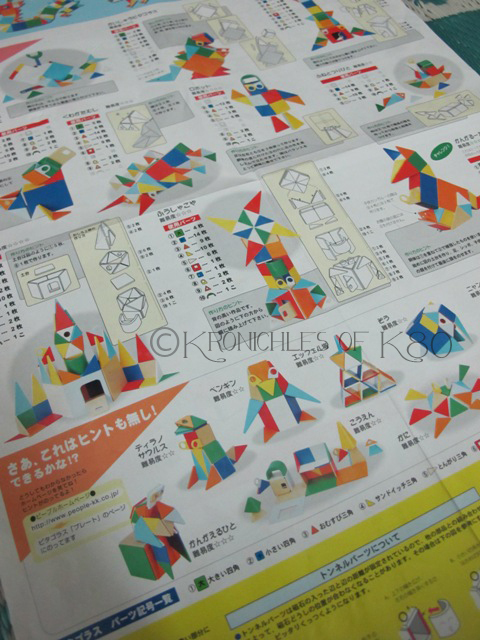 All the instructions are in Japanese. But fret not! It comes with diagrams, plain and simple, that anyone to understand! This set improves the child’s logic and mathematical reasoning. It is also said to provide stimulus to the right side brain while kids use their creativity. 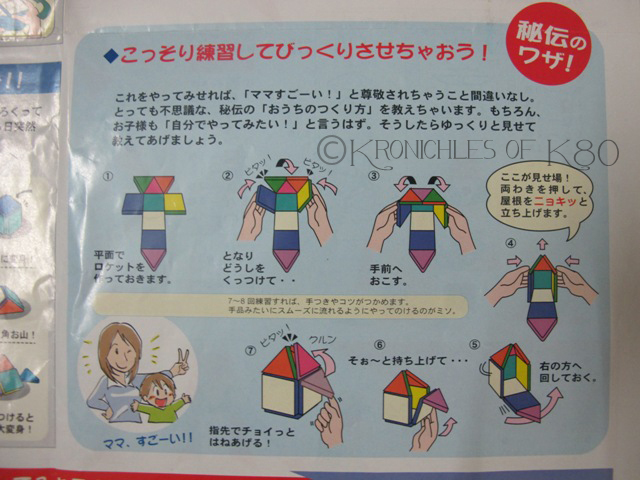 And encourages the child to proceed from 2D to 3D thinking patterns! KT and her friends love this set! They play with it almost every other day. They make doll houses and castles! I am not sure if it’s available in India. However, though not the exact ones, there are similar magnetic tiles available on Amazon! These are awesome! Will keep an eye out to find something like this here in India too. I am sure my daughter will love this. Your dad is awesome to have made sure that your daughter gets it! I loved it!. 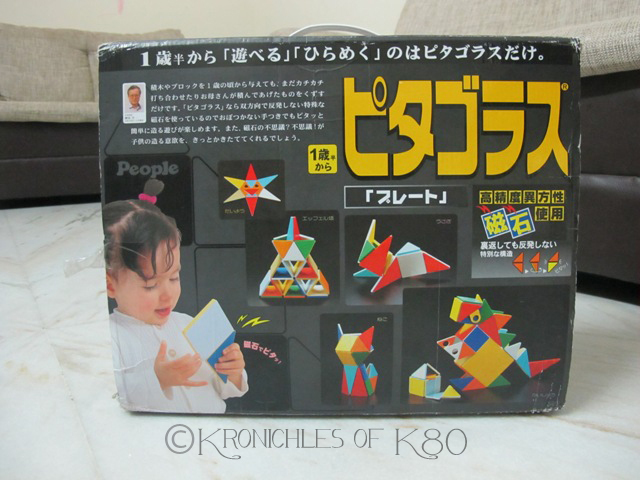 Lv played with some similar ones in stellar play museum- they were magnetic n on geometrical shapes like the one above u can make 2ds by putting them on white board.. Wasn’t sure if I can make 3ds with them :).she being 15 months had fun I am sure yr baby must have has fab time :)!.